His last flair up involved not feeling enough confidence to meet the pressure and deadlines of his job, feeling like an imposter in his work, and he further tells: “I feel my guts when things are out of balance and stressful, last time, it involved a contract and a (co-worker) becoming not nice, and it hit me directly in my stomach, I get cramps, have to go 10X a day, really gassy, its not the best version of me, it was knocking down my confidence, nothing was really balanced.” His first flair up was triggered by bacon and stress. A “not nice” coworker on the production of a “reality” TV show our patient worked on, would exploit the real-life participants, and thus create real problems for them. In one case he felt like he was becoming this woman participant’s “protector” even when she was naÃƒÂ¯ve about what was happening to her. There were other shows too, he worked on, that he couldn’t ethically agree with, and he’d feel bad for leaving his family life to go on set at a distance from his son and wife he felt he should be there for. These situations are “the perfect storm” to cause a bad episode, and he described it as “pretty deadening”. He also went to the psychotherapist and then to me because of his reactions to conflict with his wife when he would fear she would leave him: “…we have a fight and my subconscious mind feels she’s going to leave, then I want to protect my belly.” He traced this to his childhood when his parents would fight and he’d want to “disappear” and he got the “image of a little kid hiding behind a rock”. He had a recurring dream of losing his shoes when he really needed them, and a nightmare when he was very young of being in some sort of Alice and Wonderland scene where a bunny was getting his skin getting taken off, the image still very clear in his mind. I got a fast start on this case by remembering another case I consulted on for a student homeopath whose patient went quite deep into her levels of sensation (Sankaran method) including her recollection of the Stevens-Johnson syndrome she had as a kid, a Staph condition where outer layers of the skin fall off. Her confluence between body and mind had to do with being exposed, in the context of not wanting to expose herself as an individual but rather wanting to be a part of a community, a repeating unit or cycle, finishing the analogy by mentioning the sea anemone. The bunny dream and exposure element in my case reminded me of this former case, which I had suggested giving sea anemone to. Unfortunately, that case wasn’t followed through and therefore wasn’t so reliable, but I found many other commonalities with my case and wasn’t going to dismiss the correlations just yet. Then I studied Cynthia Shepard’s proving of Anthopleura xanthogrammica, the giant green (sea) anemone. She says the anemone family of invertebrates named the Cyndarians which were the Coelenterata (Gr. for hollow intestine) have but a single body cavity, which serve to provide digestive, excretory and respiratory functions. When they are exposed to air for a reasonable time period, they adapt by withdrawing their tentacles and contracting their columns, which reduces the surface area exposed to evaporation. This idea of withdrawal is seen in different ways in the proving, for instance one prover said, “I feel at a much lower level as a person. My thinking, emotions and intuitiveness is not coming to the surface” Another prover reported this feeling: “Insulated from others on outside, in own world on inside, numbed, a wall between” This wall between thinking and feeling or sensing and no senses was expressed elsewhere: “…I like to sense, feel and be 100% where I am, and now that's taken away (by a numbness taking over part of his brain), there's no way you can "be." 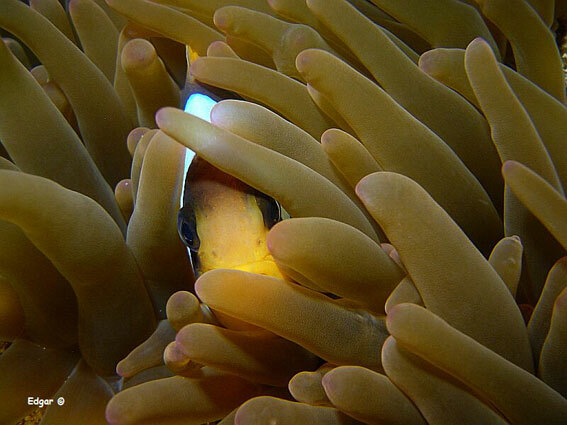 Especially tropical sea anemones often have symbiotic relationships with algae and certain fish, like the clown fish for instance. These fish will be protected from predators by the fish-eating anemone because they can avoid its neurotoxic tentacles just enough to build immunity to the poison, can take advantage of the leftovers, and in turn clean up the anemone’s dead tentacles. I wanted to give him an anemone that would be symbiotic with fish so that the element of protection was included, quite strong in his case. The remedy I had available demonstrated some of that behavior, so I started with it, a 200C of Heteractis malu, repeated once in 2 weeks after the first dose. The most exceptional thing was when I was taking the remedy there was this feeling of clarity that lasted a week, I could focus on things, my head was less cloudy, I had this precise focus on everything and felt a lot lighter which I continue to feel. I recognize work problems but don’t internalize. My stomach has also been better. Looking at what would cause me to flair up, which was stress related, I’m not internalizing it, so it hasn’t set off the other chain of events…. The environment has been OK, but things within that, which would normally bother me aren’t. My mind at night isn’t going around, problems don’t become me, before these flair ups would get obsessive for me, weigh on my mind at all points. In that first wonderful week less face tension, has come back a little. …. There’s still ridiculous corporate things gong on but it doesn’t bug me the way it used to, I can put it away, and there’s something liberating about being able to intellectualize it but not internalize it…. I want my son to be safe, not be around hostility, and I’d react to kids on the playground who were being obnoxious, its probably related to when my parents were divorcing and me witnessing them yelling, so I’ve always been cautious about exposing (my son) to arguments. The other night (my wife) and I got in an argument and he was in the back of the car, and I hardly noticed he was there. And he asked me why I was angry. It didn’t affect me...I didn’t really feel so concerned, I felt less sensitive, and more passive than I thought I would. I felt… I’m doing the right thing as opposed to something I have no choice but to do. And after the argument I didn’t feel insecure about the relationship. I put (my son) to bed, and we never resolved it until the next day, and then I thought we’ll talk about this later and it’ll be OK, before my head would have went to figuring out our divorce plan, but I just didn’t. I was impressed with the result, and found his watching of the Disney animated movie Finding Neemo a nice bit of synchronicity. It made me want to give him an anemone that protected clown fish. I ended up giving him the same remedy however in a 1M, (Heteractis malu) but I ordered Stoichactis kenti, a favorite amongst clown fish. I’ve now been seeing this patient for 9 months and he’s done very well in every way. He’s gone through and continues to go through a big shift. I did change the remedy to Stoichactis kenti after the third follow up, and he had some very pertinent dreams and a good response. In general he remains less protective, letting go of what he can’t do for his son, or other harming inequities he has no control over, and is dealing with conflict very well, “getting it out”. He is definitely integrating his body and mind, which remains quiet for the most part. His confidence has improved a lot, not taking things as personally and thinking of himself more. THE SEA ANEMONE IS THE SAME WITH RED SEA ANEMONE AS HOMEOPATH MEDICINE? 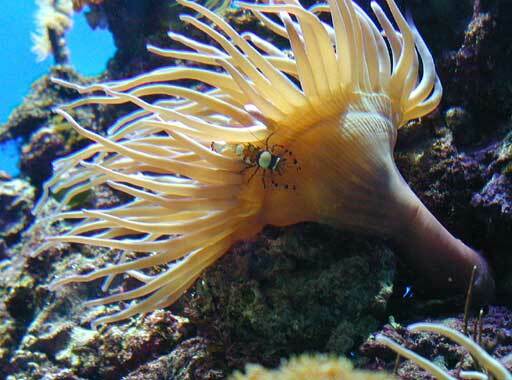 Did any one ever find a relation betweeen the sea anemone and the nasal polyp? They seem so a like!